Have you ever heard of Fruit Ninja? What about Angry Birds? These are mobile apps that thrived through their unicity and became instant stories of success in a constantly growing market. These applications were successful, but there are literally thousands of other mobile games that never see the light of the App Store or Google Play Store’s top seller pages because they do not bring anything unique to the table, neither excel in the already used concepts that they are based upon. Having a great idea for an app is only the first step, as the way you execute this idea will determine whether your app will be just another unimportant addition to the store, or if it will be on the lips of every mobile device user in the world. In this article, you will learn what are the steps you need to take in order for your app to be the stuff of mobile app legend, as it is designed to help both new coming developers and experienced developers struggling alike. One problem that a lot of developers have due to a mistake in early development of the app, is the fact that they don’t set out with a clear vision in mind of what they want the app to do, so make sure that you have well structured idea of what your app’s strengths and selling points are going to be. As mentioned earlier, a mobile app can either be an original concept no one has attempted before, or it can be something done a thousand times over. Your mission is harder if your app falls under the second category for multiple reasons. First of all, every app in the app store is placed in a category it pertains to, such as Education, Gaming, Travel, Photo and Video, and so on. If for example, you app is a photo filter app, its first set of competitors is represented by all other photo filter apps available on the market. Secondly, let’s say your app becomes the most popular photo filter app available. Once you get in that position, your app’s competitors change, and it now battles with the most popular apps from ALL categories. Take into consideration that some app categories are more popular than others, the most popular categories being Gaming and Education. All this is not to say that you can’t be successful with an app that’s already been done before, but you have to make sure that yours is the best there is by bringing something to the table that other photo filter apps (as per our example) do not offer. It is very important to put every single detail, no matter how small, on paper. Structuring your game plan physically in form of you is a very important step, so sit down and write everything related to your app from how the interface is going to look like, to what it’s going to do, what its features are going to be, and so on. Many app developers skip this step so from the moment they think of a feature or improvement for the app to the moment they actually start the development process, a lot of very good ideas end up getting lost in the process. Before the developing process can start, you have to take the time to get acquainted with everything surrounding this domain. Get to know your competition, such as how many apps of the same type of yours are currently on the market and what they offer. If you see any kind of flaw or room for improvement with those apps, think of ways you would fix or upgrade them and add those ideas to your own design. Investigate how people make their money off of apps, which marketing strategies are most popular and efficient in the app business, and which you could use for your own app. Once you figure out what and how you’re selling, you need to figure who you’re selling it to. Build a customer profile and get your hands on a demographic. See what type of people would be interested in buying the kind of app you’re selling, then promote your product and establish a marketing presence in the places where that demographic can be usually found. This is the next step to take after all the previous requirements have been met. Most people enthusiastic about developing an app do not possess the necessary set of skills that would allow them to develop their own app, but if you are one of those that do, it’s great news, as you can start developing the app immediately. However, if you find yourself among the people that do not, it’s time to start looking for an app developer you can trust with your project for a good portion of the foreseeable future. You must make sure that the developer you hire has a decent amount of experience in development. Ask them about their previous work and see if may be they have worked on some successful apps in the past. Then there’s the price issue. Each developer has its own, so see how much your developer will charge you. 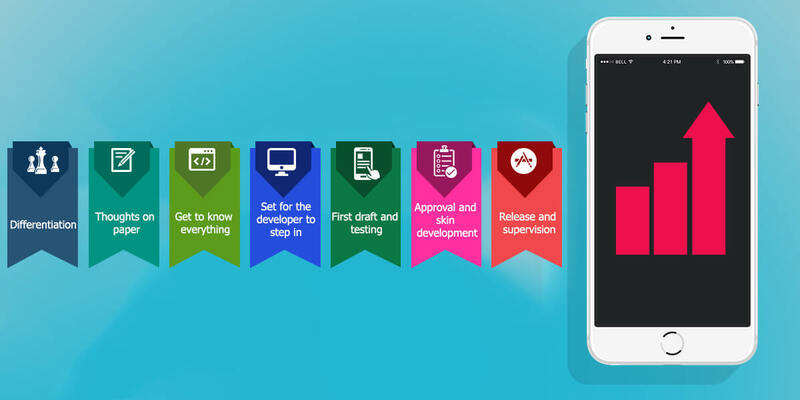 The developer should be able to provide you with a prototype, or first draft, of the app in a relatively short period from the project start. If you are developing the app yourself, you can use services such as HotGloo and Moqups to create the storyboard, which will show how every screen on the app interacts with another, where are the buttons and where they take you, and so on. When the prototype of the app is finished, it is time to get the first results by asking people to try it out. Friends and family may be a little biased but it’s good to get their impression anyway. Asking strangers for their impression is valuable information, as is all feedback. Feedback is what will help you improve and fix your mistakes. Skins represent the actual app screens, which hold the high resolution images for your application. These get put in after your app has successfully passed the testing stages. The app needs to now get approval for being put on the various market places such as the Apple App Store or the Google Play Store. Some may take a couple of days so it’s a good idea to get started on this step as early as possible, otherwise the release of the app might be delayed. It is time to release your application to the whole world to experience. Once it’s up and running though, the struggle just begins, as now it must be monitored and tended to. Advertisement has to be made as mentioned in a previous step, as well as upgrades. Periodically, there will be software changes or bugs that get noticed, meaning that you need to update your app so that it stays relevant and continues to generate revenue. People tend to flock towards new and cool things, but they just as easily abandon it when there is no more excitement left, so respect the power of the customer and do not hesitate to make your app better every time you have the chance to. There are a lot of factors that can influence the success of your application, but this article presents guidelines that will help make sure that even though the journey ahead won’t be without challenges, you are taking the correct path towards achieving your goal and definitely leaving your mark on the mobile app market.